Etha Eleen Vinesett was born Dec 14, 1896 in Gaffney (Grassy Pond area), Cherokee County, South Carolina. She died Sept 9, 1989 in Fort Mill, York County, South Carolina. She married Walter Wilburn Buchanan. John Smith Vinesett married Mary Jones Humphries. John Smith Vinesett was the Cherokee County, South Carolina coroner for 28 years. He had only one arm (reason unknown for the one lost limb) and also owned and operated a small grocery store. 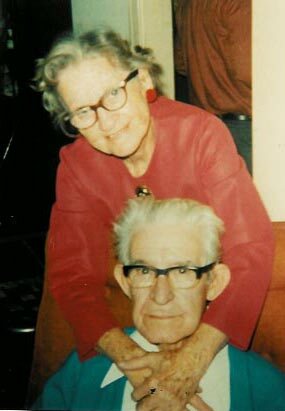 One of his grandchildren, Francis Kathryn Buchanan McCallister, vividly remembers as a child visiting with him where he would bounce his grandchildren on his lap and make them laugh while always giving them, not one piece of candy from the supply in the store, but instead giving each of them a small bag of candy. Johnson Vinesett married Nancy Christmas Smith Nance (Sarratt Turner) born in 1841 and died in 1924. She was born on Christmas day and was named after her mother's maiden name (Smith) and her father Dr. Zachariah B. Nance. Her first marriage was to James Calvin Turner born 1840 who was killed in the Civil War in 1862. Her second marriage (1862 or 1863) was to William Anthony Sarrat born Oct 28, 1838 who was also killed in the Civil War Jun 16, 1864. Third marriage was to Johnson Vinesett around 1864/1865. >Mary Elizabeth Turner (1859-1864) "Drowned"
>Doc Nance Turner (1861-1864) "Drowned"
>James B. Turner (1862-1864) "Drowned"
John Vinesett married Mary Farmer. John Vinesett born 1770. Married ? Died ?